Talk to any study abroad office and one question that always comes up – when should we open our applications? The competing thoughts are – too early and people forget, too late and people don’t have time. Well, according to research done during the University of Arizona Summer 2018 application cycle, most people procrastinate! Let’s set the stage. Our Summer 2018 application cycle officially opened on July 1, 2017. The official deadline for applications was February 25, 2018, with some programs extending deadlines into March. Between June 2017 and March 2018 we had 1,652 applications processed for summer 2018. 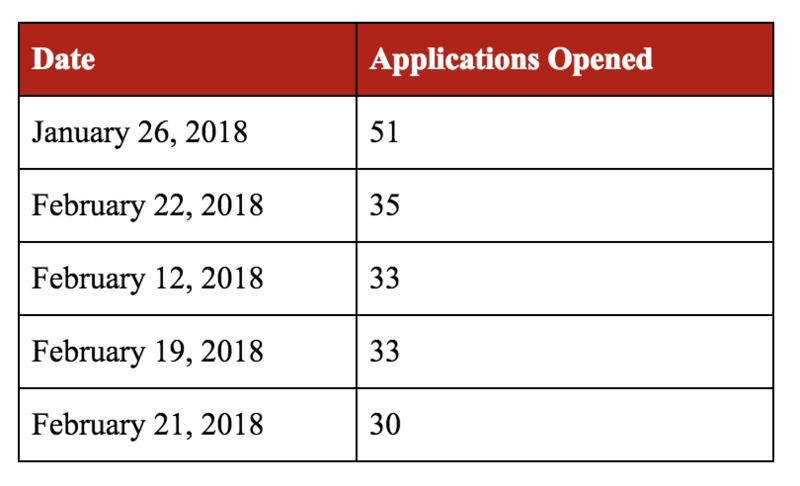 Of those, 60.4% were opened in 2018 – meaning in the final 2 months of the application timeline. On average, 20 applications were created each day in January and February. As you can see, 329 applications were completed in the few days before and after the deadline – that’s 30% of all applications! Now, if you look at the relationship between how early they apply and whether or not they complete their applications, there is a fairly clear line. Students who started their applications after November 1st were 41% more likely to commit to a program than those who started earlier. 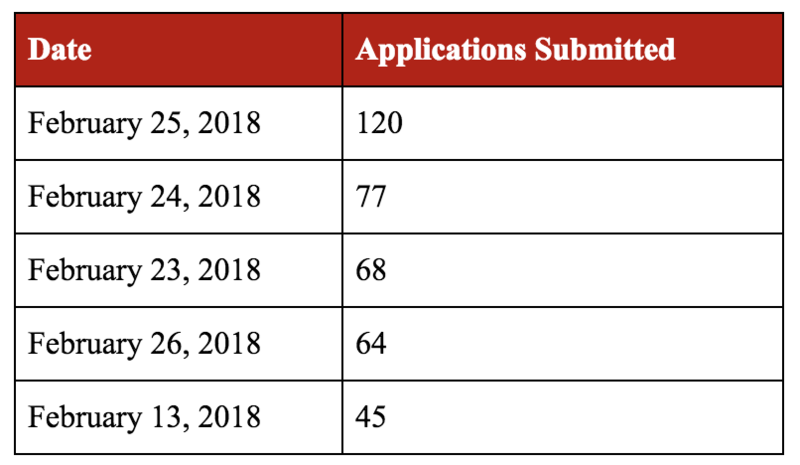 As you can see, four of the top five application opening dates are the same week as the deadline. A clear indication of procrastination by our students. However, the number one date was almost a month earlier, January 26th. This wasn’t a random date by any stretch. That was the date of a special study abroad fair for our College of Agriculture and Life Sciences students. This event had an application fee discount as an incentive for opening your application on the spot, and as you can tell people took us up on that. 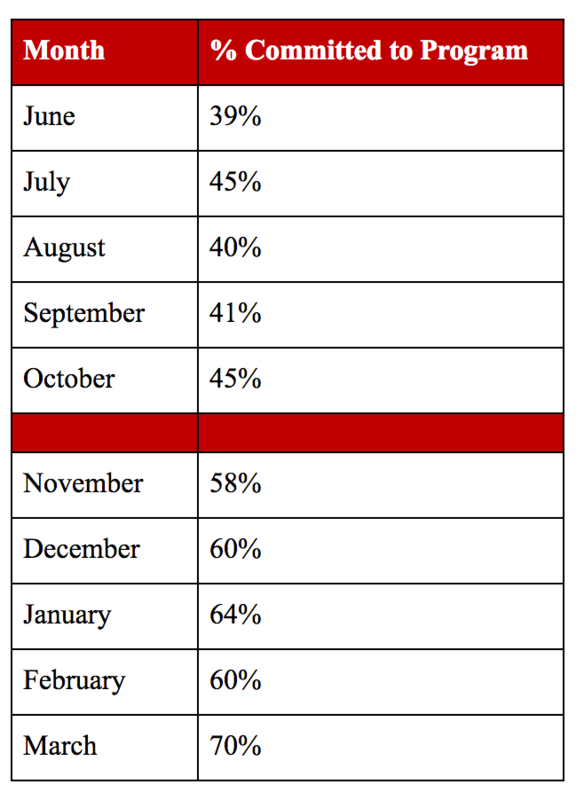 There is also a corresponding uptick in completion rate in January. This, at the very least, indicates that the discounted application fee did not have a negative impact on completion rates. And as a result, for Summer 2019 we expanded this model and hosted a series of college-specific fairs on January 23 and 24. To date, those two days far exceed the record application opening dates from previous cycles. While it may be simple to say “let’s just open applications in November” this does ignore a population of students that do want to plan ahead. Our team’s determination has been to create more opportunities to encourage students to plan ahead while taking staffing and organizational measures to account for the large majority that will procrastinate.